This takes you straight to their pedigree database; if you then click on the bottom right female you will go back and back to the foundation of that line. Sorry - you do have to put the name of a horse in the pedigree name area first! Sometimes when you put the pedigree name into these data bases and they come up blank, it probably means that the history doesn't go back any further than to Desert Bred. Our female line is also Milordka 1810. Sire line is Kuhailan Haifi. Love Forbis, but remember she is speaking purely of straight Egyptians...in the desert regions, Poland, India...et al, the strains individually might be interpreted slightly differently. Look at Carl Raswan's mangling of the Menaghis. Because his friends were of one tribe who were bitter enemies of those breeding the Muniqui, Menaghy, (note the strains are spelled phonetically ergo the differences in spelling), people would think they were the ugliest of all the strains whereas, a quick look at some of the most beautiful horses to have ever graced a showring would quickly dispel such a notion having seen the incredible Amber Satin who traced to the Crabbet bred Fejr. Conversely there are, according to one of the Upton brothers in a conversation years ago...think it was Roger but could have been Peter, those tribesmen that think the Menaghis are the most beautiful of all. Everyone seems to agree they have the greatest speed...and if you know there is only one Menaghi tail female descendent in the race (check those all TB lines)and the horse is chestnut...undoubtedly all else being equal, that is your winner! Mitochondrial DNA aka mtDNA, has really been a boon to the breeder. First it establishes the uniqueness of the horse's dam line. But what has been a bit of a monkey wrench...it has established that, for example, the Seglawi al Abd, the Davenport import mare, *Wadduda shares the same tail female with the Kuhailan Ajuz of Ibn Rodan...Rodania! Does that make their strains still different? Yes IF you look at the strain as a desert political statement...In other words a mare could be purchased, stolen, won in battle and brought into and kept within a tribe for generations...Her characteristics would descend and reflect reflect the strain that particular tribe was renowned for breeding over the generations. And lastly what MUST be remembered was that up until the late 1800's, those horses were inbred to a tremendous degree...for generations depending on how frequently - once every 5-10 years - a suitable stallion could be found with which to outcross a mare. Ergo...the incredible power of the dam lines/tail females/strains. Also goes a long way to understand why some lines breed on more significantly than others, e.g., a recently captured mare whose offspring only reflect 100 years of generational strength vis a vis 500. Milordka? She was the foundation line and that is why you don't find her in Janow's website. I'd like to add that the Seglawis as a group...Ibn Ed Derri (Basilisk), al Abd (*Wadduda) and Jedran (Bint Helwa)...all tend to exhibit the particularly strong characteristics of extreme intelligence, loyalty, courage and athletic ability...besides nearly ethereal beauty. Greatest example in recent memory? Carmargue! Wow! indeed, Fiona. Thank you Egbert! Fee - I can't find the thread telling you how to work out the tail female line? I would love to do it for mine. Thanks, honey! I have discovered that Kofi's tail female line was to Ghazala but I don't know what it means!! Also, Khan's seems to go back to a mare called Mahawiliyha, haven't heard of her in the dsicussions.So how do you work out the strain,then? I think Khan's is given a clue by the fact that his name is Khan El Ajuz but again, don't know what it means. See what you've started me on, now Fee!! I should be doing lots of other important things this morning but instead I am feverishly running through pedigrees. Both Kofi and Khan go back through the stallion line to Barq and I really want to know about Mahawiliyah (grey, 1935) so I can trace Khan's mare line - it would be amazing for me if they were actually the same "strain"/"type" or whatever because I know nothing much about breeding,and I will be gobsmacked if I find out that I have chosen two horses that there is a "real" reason why I think they are so alike.Apart from to my uneducated and inexperienced eye, that is. I thought Kofi was just wonderful and I did try to find a new boy who had all Kofi's good points and to improve on the few small faults I think he had. The book you really need to get hold of his Gazder's THE ARAB HORSE FAMILIES OF GREAT BRITAIN...After you have found the tail female line, in that you can find the strain. Ghazala, presuming we are discussing the same Ghazala...there are some others wandering about, who was a daughter of the great Bint Helwa who trace to the Abbas Pasha mare Ghazieh, a grey seglawi jedran. What made Bint Helwa so remarkable was her stunning courage. Gentle, kind, loving to all, she broke her leg one day while out in pasture and apparently walked home something like 5 miles on the leg and waited patiently at the gate for someone to come and get her. Upon seeing this, Wilfrid Blunt, not known for sentimentality, was so overcome that he would not have the mare put down but instead insisted that the vets figure a way for her to be suspended until it was time for her to foal...6 or more months down the line. She was and she gave birth to a filly and several more foals afterwards. Sadly the line died out at Crabbet but came back via the Ghazala descendants. Clearly she passed the loyalty, sweetness and incredible courage...those elements that made Carmargue one of the most famous of her descendants. He nearly died in Spain and Diego Mendez was to say later that he was the most courageous horse he had ever known as he refused to lie down and die when three vets said he was too sick to go on and wanted to euthanize him. Instead, he recovered and went on to win the World Championship! Clearly you have some very special horses. Yes I agree Kofi, it's obsessional! I should be getting ready for Overtoun tomorrow instead of trawling pedigrees and arab websites! Thanks again Egbert for all your knowledge! Your welcome! And yes, isn't it obsessional? Though more like reading a great whodunit! As you come to know the various horses and how they crop up in a pedigree...it really becomes fascinating to learn about each and everyone. That is why the old GSB and Crabbet horses are so important. Not only do these horses appear fairly close up in the UK pedigrees...BUT even more importantly the opportunity exists to find those still living that knew the horses way back in a pedigree! Moreover another boon is the correctness of the old UK bred lines...There just are not horses with better overall conformation. Get a great GSB horse and they can be bred to the most modern of lines and the results are often more spectacular than one can imagine. One horse immediately coming to mind is Panache out of the straight Crabbet Rose of Bediya, as well as her granddam, Crysilla out of the incredible Crystal Clear. 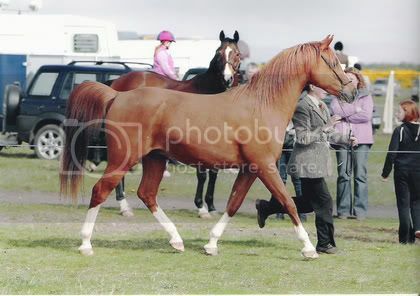 Surely Crysilla was the most beautiful Chestnut El Shaklan daughter that ever lived! Ah yes...welcome to the PASSION of the Arabian horse! Thank you so much, Egbert!! That is fascinating and I'll look out for the book you've mentioned. Kofi (Alpha Laval)was only 14.1, had good bone and was a sturdy little horse but still moved beautifully. So I looked for another small one in Khan. The only big difference in them is their heads. Kofi was a very handsome horse and Khan is more of a "pretty boy", more of a dish and is much narrower around the noseband area.His eyes are also more round. My good friend Egbert is a deep well of knowledge and I am so happy she is my long time friend so I can bother her every day (not quite but nearly) with horsey detailed questions! Thanks Egbert! Many thanks! Never a bother as you always ask the most intelligent questions! Dear Egbert, since you mentioned Mahawiliyah and as the line isn't all that common, I thought that a couple of photo's of a dear departed friend (who happened to be a direct female descendant), might be appropriate. The pedigree http://www.allbreedpedigree.com/suhla+el+kheil is perhaps interesting. One thing the Bint Helwa line does rather well is to produce significant sires Will Al Lahab perhaps turn out to be the latest of these I wonder? PS That isn't me with the "Power Hair"
It is one of the few pedigrees that is not only a stunning one in terms of genotype it is 110% reflected in the phenotype if the photos are a measure...though with her multiples to Irex and line breeding to Skowronek and his son Naseem...am not surprised at her beauty. At the 5th-6th generations, she is heavily Kuhailan throughout. Going back to the linebreeding to Skowronek: 12 lines alone to Naseem throughout; one line to Skowronek via Registan in the Egyptian stallion's Fakhr El Kheil's dam line; as well as lines to (3)Raswan, Naziri, Nasifa, Seriya, Naxina and then there is a most interesting line to a stallion named Miraze, who some argue, was sired by *Mirage not *Nasik! Finally...the entire pedigree is bathed in Mesaoud...sort of the stock of the stew. She should have been a wonderful dam and am wondering if the above foal is a reflection of how nice her foals were? Am also curious if she was an scid carrier or was suspected of being? Will be going down to Om El Arab in the next few weeks and will tell you how the Lahab youngsters look there, Mike. Have you seen many? ER...Knew that wasn't you, Mike! Don't think you would have been wearing that sweater! I too am proud to call Egbert a friend , she is a wealth of information, and it has long been my desire to get her to write a full and factual article on bloodlines and in particular the Carmargue phenomenon,as to what made him so very special, I am sure she is always so busy, but maybe one day problem with these little snipits of information is that not everyone looks at all the threads and they dont know what they are missing . Khan's great grand dam was Salima Dawn as well. I don't know how to post a link but his pedigree is on allbreed - his full name is MAS Khan El Ajuz.